TOKYO AFP Sept7, 2018- Japanese rescue workers with bulldozers and sniffer dogs scrabbled through the mud Friday to find survivors from a landslide that buried houses after a powerful quake, as the death toll rose to 18. “We’ve heard there are people still stuck under the mud, so we’ve been working around the clock but it’s been difficult to rescue them,” a Self-Defense Forces serviceman in Atsuma told public broadcaster NHK. “We will take measures to find them quickly.” An elderly woman in Atsuma told NHK: “My relative is still buried under the mud and has not been found yet, so I couldn’t sleep at all last night. 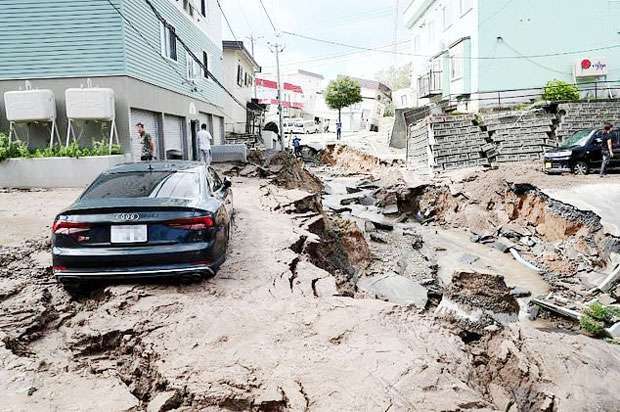 There were also several aftershocks so it was a restless night.” Around 1.6 million households in the sparsely populated northern island of Hokkaido were still without power after the quake damaged a thermal plant supplying electricity to the region.